All international flights arrive at Budapest Ferenc Liszt International Airport (BUD) at Terminal 2A or 2B, depending on the airline. The airport is approx. 20 km from the Budapest CLC. There are several ways to get into the city centre and to the Budapest CLC. The cab rates have been standardised in Budapest so all cab companies cost the same. There are cabs waiting in front of the departure hall of the airport but taxis can be booked by phone as well. It takes about 20-40 minutes to get to the CLC from the airport, depending on the traffic. It costs approx. 25€, depending on the km in the taximeter. In case you need any help, please do not hesitate to contact us. The transfer operates as a shared-ride service, which means that passengers travelling to / from the same / closely situated address are escorted in the same vehicle. The AirportShuttle-Minibus Desks are to be found at every terminal (Terminal 2A and 2B) and welcome the arriving guests to Hungary. All Minibuses arrive to and depart from the Terminals’ Main Entrance. It operates 0-24 hours. It takes minimum 60 minutes on weekdays. Take the bus 200E towards Kőbánya-Kispest, which is the last stop of the metro line M3 (23 min). Get on the metro M3 towards Újpest-Központ and get off at the 7th stop called Corvin-negyed (15 min). Take the tram 4 towards Újbuda-központ or the tram 6 towards Móricz Zsigmond körtér and get off at the 3rd stop called Petőfi híd budai hídfő (6 min). Walk to the CLC, which is a one-storey building on the corner of Bogdánfy Street and Warga László Street, next to a sport court (3 min, 280m). Each stop is 3-4 minutes walking from the CLC. Please consult the route planner and timetable app at the public transport website of Budapest. Your destination is: 1117 Budapest, Bogdánfy utca 10/a. The CLC is a one-storey building on the corner of Bogdánfy Street and Warga László Street, next to a sport court. Our building is in 10-15 minutes reach from the main motorways (M0, M1, M5, M6, M7). We have a limited number of parking places in the parking lot in front of the building of the CLC, so please call us, or ask the parking lot’s colleagues where to find other nearby parking places of Eötvös Loránd University. GPS: Bogdánfy u. 10/a, N 47°28'28" E 19°3'27"
Please feel free also to arrive by bicycle! You can arrive in Budapest at the following railway and bus stations. (Each of them has a metro stop, so it is quite easy to get to the CLC from any of them). From Déli Railway Station: take tram 18 towards Savoya Park and get off at the 7th stop called Móricz Zsigmond körtér, and then take tram 6 to the 2nd stop called Petőfi híd budai hídfő (approx. 25 min) or take metro line M2 to Blaha Lujza tér and get on the tram 4 or 6. From Keleti Railway Station: take metro line M4 and get off at the 6th stop called Móricz Zsigmond körtér, and then take tram 6 to the 2nd stop called Petőfi híd budai hídfő (approx. 20 min). From Kelenföldi Railway and Bus Station: take metro line M4 and get off at the 2nd stop called Újbuda-központ, then take tram 4 to the 2nd stop called Petőfi híd budai hídfő (approx. 15 min). You can use the public boat services to get to Infopark. Boat D11, D12 and D13 stop at Egyetemváros - A38 ship, which is only 5 minutes walking from the CLC. According to the public vote of Lonely Planet, A38 Ship is the best bar in the world, and it is only 5 minutes walking from the CLC. Szimpla Garden, the famous ruin pub is the third best one and by public transport it is 20 minutes away from the CLC. 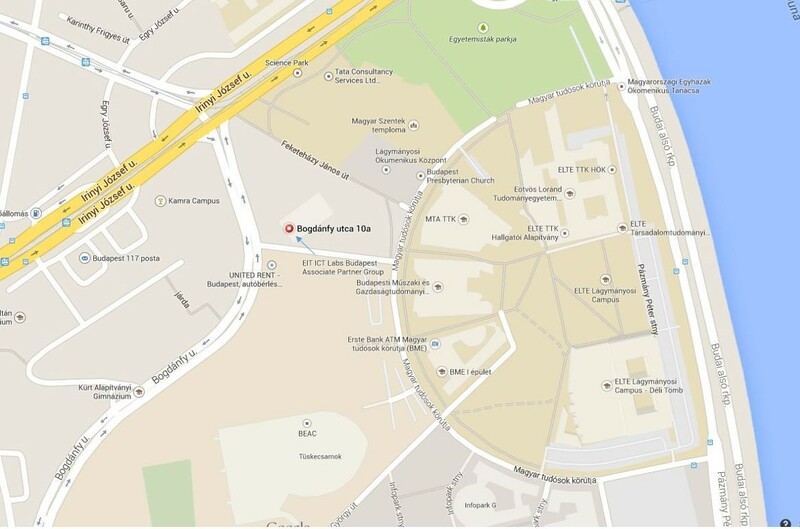 Click here for the map of the Infopark and where to find the Budapest Node in this area. Arriving from Bogdánfy Street please walk along the building on the right side, closer to Warga László Street and not to the sport court until the windowed door of EIT Digital. Infopark is the first innovation and technology park of Central and Eastern Europe. It is an innovation centre primarily for IT, telecommunications and software development companies where the European Institute of Innovation and Technology (EIT, which is a body of the European Union based in Budapest) and such multinational companies as Lufthansa Systems, IT-Services Hungary, IBM, Magyar Telekom, as well as young innovative companies found a place for their head office. Infopark is situated in the 11th district of Budapest, near the Buda abutment of Rákóczi Bridge (ex Lágymányosi Bridge), in the neighborhood of the university buildings, opposite the National Theatre and the Palace of Arts. The area is easy to access by car, by bicycle or by public transport. The Co-Location Centre in the Infopark has a perfect location at the heart of Budapest in the capital of the Central-European startup and R&D region.